CHANEL 166 AMOUR glossimer was first released around Valentine's day 2012 with the launch of the ROSES ULTIMES DE CHANEL collection. There were six glossimers and four nailpolishes released with that collection and Amour along with Jalousie were the two most popular and quickly sold out. At that time, the six new glossimers were supposed to be limited edition but since then Chanel has added them to their permanent line of glossimers - at least for now anyway, yay! Check out the past collection here: CHANEL: ATTRACTION. DISTRACTION. AMOUR. In March of this year Chanel launched the COLLECTION RÉVÉLATION which consisted of ten glossimers and one nailpolish. Of the ten glossimers five were re-promotes and five were new additions to be added to Chanel's permanent line of glossimers. With the release of that collection we saw that Chanel had once again re-promoted Amour and Plasir (both glossimers are from the original ROSES ULTIMES DE CHANEL collection and are already included in Chanel's permanent line of glossimers). 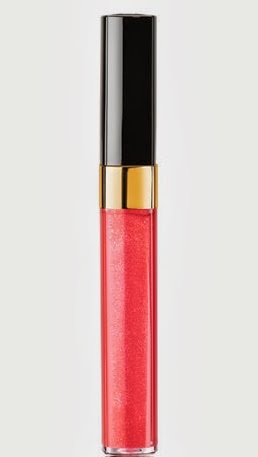 CHANEL 166 AMOUR GLOSSIMER is described as a light to medium coral pink with miniscule flecks of pink, green and silver sparkles. Once applied on the lips the sparkles are not very noticeable. There is a somewhat tacky (not sticky) feel to the gloss but it is barely noticeable as well. This glossimer leaves a nice color on the lips but it is rather sheer. You can build up the color by re-applying several applications of the gloss for a more opaque look. The glossimer is currently priced at $29.50 USD for .19 oz. of product and can be purchased at any major department store, Chanel Boutique, or at Chanel.com.